One living Chinese giant salamander from Guangxi Province. Credit: Robert Murphy. With individuals weighing in at more than 140 pounds, the critically endangered Chinese giant salamander is well known as the world's largest amphibian. 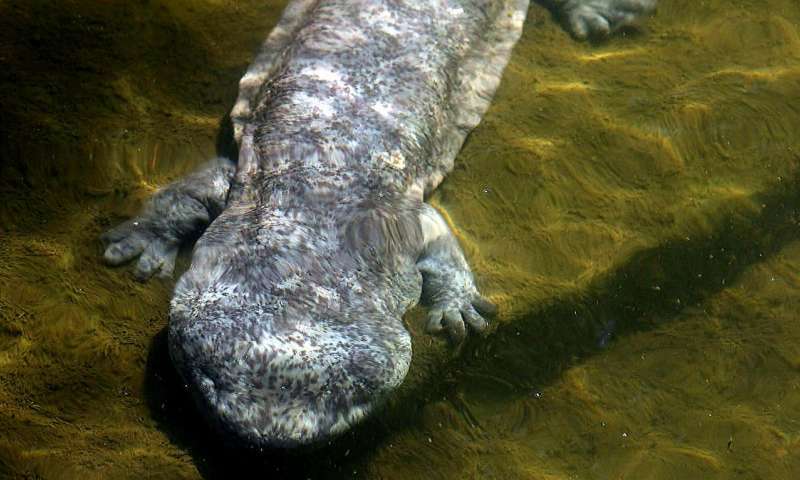 But researchers reporting in the journal Current Biology on May 21 now find that those giant salamanders aren't one species, but five, and possibly as many as eight. The bad news as highlighted by another report appearing in the same issue is that all of the salamanders—once thought to occur widely across China—now face the imminent threat of extinction in the wild, due in no small part to demand for the amphibians as luxury food. The discoveries highlight the importance of genetic assessments to properly identify the salamanders, the researchers say. It also suggests that the farming and release of giant salamanders back into the wild without any regard for their genetic differences is putting the salamanders' already dire future at even greater risk. In fact, some of the five newly identified species may already be extinct in the wild. "We were not surprised to discover more than one species, as an earlier study suggested, but the extent of diversity—perhaps up to eight species—uncovered by the analyses sat us back in our chairs," says Jing Che from the Kunming Institute of Zoology, Chinese Academy of Sciences. "This was not expected." "The overexploitation of these incredible animals for human consumption has had a catastrophic effect on their numbers in the wild over an amazingly short time span," adds Samuel Turvey, from ZSL (Zoological Society of London. "Unless coordinated conservation measures are put in place as a matter of urgency, the future of the world's largest amphibian is in serious jeopardy." The researchers were surprised to learn just how much movement of salamanders has already occurred due to human intervention. Salamander farms have sought to "maximize variation" by exchanging salamanders from distant areas, without realizing they are in fact distinct species, Che explains. As a result, she says, wild populations may now be at risk of becoming locally maladapted due to hybridization across species boundaries. The researchers including Ya-Ping Zhang and Robert Murphy suspected Chinese giant salamanders might represent distinct species despite their similar appearances. That's because the salamanders inhabit three primary rivers in China, and several smaller ones, they explain. Each runs independently to sea. Given that giant salamanders can't move across the land, they suspected that salamanders living in different river systems might have had opportunity to diverge over time into what should now be recognized as distinct species. And, indeed, that's exactly what the genetic evidence now suggests. In the second study, Turvey and colleagues conducted field surveys and interviews from 2013 and 2016, in an effort that was possibly the largest wildlife survey ever conducted in China. The data revealed that populations of this once-widespread species are now critically depleted or extirpated across all surveyed areas of their range, and illegal poaching is widespread. The researchers were unable to confirm survival of wild salamanders at any survey site. While the harvesting of wild salamanders is already prohibited, the findings show that farming practices and existing conservation activities that treat all salamander populations as a single species are potentially doing great damage, the researchers say. "Conservation strategies for the Chinese giant salamander require urgent updating," Che says. She says it is especially critical to reconsider the design of reserves to protect the salamanders and an effort that has already released thousands of farm-started baby salamanders back into the wild. "Together with addressing wider pressures such as poaching for commercial farms and habitat loss, it's essential that suitable safeguards are put in place to protect the unique genetic lineage of these amazing animals," says Fang Yan, also at the Kunming Institute.